Metal Band Member Sentenced to Six Years Prison in Iran Accused of Creating "Satanic Music"
Nikan Khosravi, a member of the Iranian metal band "Confession," left Iran for Turkey to avoid being imprisoned for six years for producing metal music, he told the Center for Human Rights in Iran (CHRI) on March 29, 2018. "The interrogators had translated my English lyrics [into Farsi] verse by verse and were asking questions about this and that word and told me I was a Satan worshipper and didn't believe in God," Khosravi told CHRI. "They really thought I was a bad person. They asked about who was giving me financial support and what were my connections." "They said my lyrics were political but I was 21 and wasn't interested in and didn't understand politics," he said. "But when you live in Iran, from the day you are born, politics get mixed into your daily life and that's why it entered my lyrics." Khosravi, 23, and fellow band member Arash Ilkhani, 24, were arrested by the Islamic Revolutionary Guard Corps (IRGC) on November 9, 2015, days after the release of their second album, "In Pursuit Of Dreams." They were accused of producing "satanic" music. At the time, the band was using a music studio Khosravi built in his bedroom at his family's home in Tehran. He and Ilkhani were also both studying English for translation purposes at nearby Roudehen Azad Islamic University. All Iranian artists, including but not limited to painters, filmmakers, photographers and writers, must receive permission from the Ministry of Culture and Islamic Guidance to publish or promote their work in Iran. Those who publicize their work without receiving a permit can be arrested and imprisoned on a variety of charges. On March 17, 2017, Judge Mohammad Moghisseh of Branch 28 of the Revolutionary Court in Tehran sentenced Khosravi and Ilkhani to six years in prison each for "insulting the sacred" and "propaganda against the state." Ilkhani is currently in Iran awaiting the Appeals Court's ruling but Khosravi left the country soon after the preliminary verdict and is seeking asylum in another country through the United Nations High Commissioner for Refugees (UNHCR) in Turkey. "I'm 24-years old. I have been living with fear and anxiety since our arrest," Khosravi told CHRI. "After the court issued its verdict, I realized that I could go to prison for six years, or maybe a little less if the sentence got reduced on appeal, so I decided to leave Iran." "I thought I was going to be executed"
Describing his arrest, Khosravi said: "Seven or eight agents suddenly raided our home and started searching everywhere, including my room. They confiscated some of my belongings and then handcuffed me and took me with them." He continued: "They told me I was accused of insulting the prophet. They also arrested Arash [Ilkhani] on the street on his way home from university. We were interrogated separately by the IRGC for 10 days in Ward 2-A in Evin Prison. I was interrogated by four or five agents." 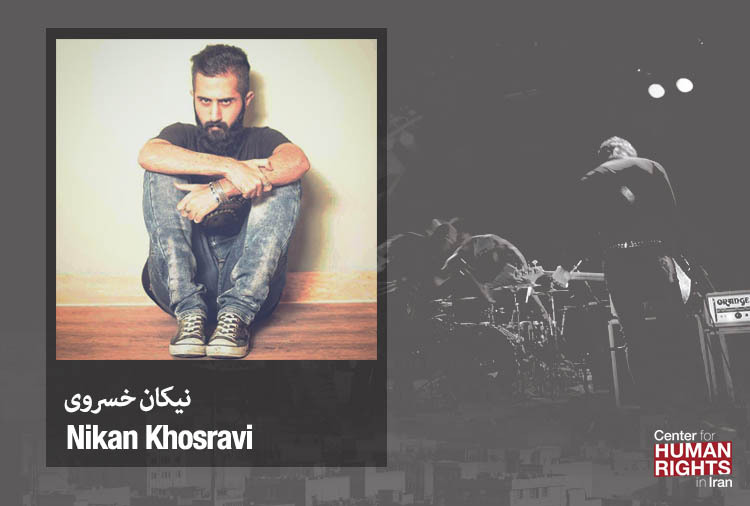 "For a long time I thought I was going to be executed but with the help of my lawyer, the interrogators accepted that my lyrics did not contain anything insulting toward the prophet or his disciples," Khosravi added. "I just had one song that was about the nature of God." Khosravi was released from detention in late November 2015 after posting bail set at 100 million tomans (approximately $26,500 USD). He was arrested again in February 2016 and held for another two months. His trial was held during two sessions on September 18 and December 26, 2016. "During the trial, the first question the judge asked was when I had started my alleged activities against the state. It was as if he was certain I had engaged in anti-state activities," Khosravi said. "I told him I didn't care about the state. He asked why I had written and sang such lyrics." "During the second court session, Judge Moghisseh again asked what my intention was in singing such lyrics and to explain my connections," he added. "The session did not last more than 15 minutes."